We have sold a few unusual items over the years we have doing the annual Liverpool Beatles auction, many of them used to belong to Beatles. These school books were used by John Lennon while he was at Quarrybank school and as school kids did, he wrote his name inside the books so they could be returned if they were lost. We sold both of these last August. 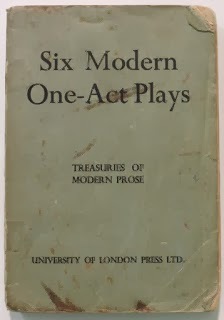 Because of the early signatures inside "Six Modern One Act Plays" reached £2800 and "The British Isles" fetched a whopping £7400! Occasionally the fan club would get hold of items to cut up and send out to the fans. 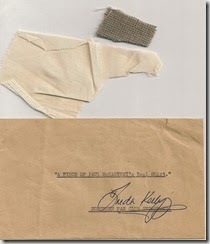 In 2011 and 2012 we sold these small pieces of Paul and John's shirts, both with notes from Freda Kelly, the fan club secretary. 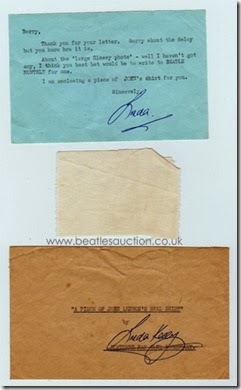 In 2011 the bit of Paul's shirt went for £220 and the next year the piece of John's shirt sold for £320. Last year in our auction a black knitted tie that was given to a fan by John Lennon in the Cavern Club sold to one lucky bidder for £3100. 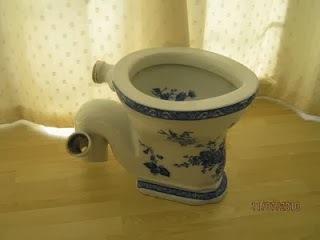 But of course, we think it will be hard to top the star lot in our 2010 Liverpool Beatles auction when a toilet that was formerly in John's house in Tittenhurst Park sold for £9500!! 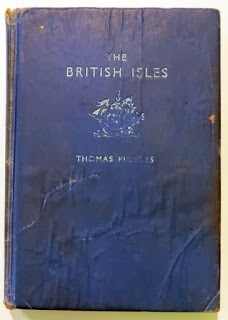 If you have something that once belonged to a Beatle and you want a valuation please contact us. The details are on the contacts page on this site. All valuations are free. A Ticket to the end of the Cavern Club. Two 1965 UK Beatles Concert Tickets.